Mitsubishi Mirage prices announced | What Car? The Mitsubishi Mirage costs from 8999 and is available to order now. Mitsubishi's new supermini comes in three trims and offers a choice of two three-cylinder engines, with the range-topping version costing 12,999. However, Mitsubishi is offering a 1000 discount across the Mirage range for the foreseeable future, bringing the prices down to 7999 to 11,999. There's a choice between a 1.0- and 1.2-litre petrol engine, with neither emitting more than 100g/km of CO2. 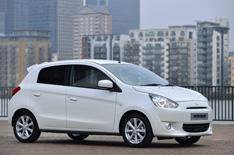 The 70bhp 1.0-litre engine is only available on the entry-level Mirage model. It gets from 0-62mph in 13.6 seconds, has average economy of 67.3mpg and emits 96g/km of CO2. It comes with a manual gearbox and there's no automatic option available. Emissions for the '2' are 96g/km, with average economy of 68.9mpg, while the bigger 15-inch alloy wheels on the '3' increase its CO2 output to 100g/km and average economy falls to 65.7mpg. The automatic version emits 95g/km and manages 68.9mpg. The 8999 entry-level version gets front electric windows, a CD player with USB connectivity, a tyre repair kit and steel wheels. Mirage 2 adds manual air-conditioning, remote central locking, four electric windows, automatic lights and wipers, privacy glass and body-coloured mirrors and door handles. Range-topping '3' cars add front and rear parking sensors, leather-trimmed steering wheel and gearlever, keyless entry and start, automatic air-conditioning and 15-inch alloys. Order books are open now.